9, compensation capacitor parameters, size, weight, etc., depending on the customer supporting the workpiece. Stainless steel smelting furnace IF power induction heating, the power range of 15KW-200KW. The company specializing in the production of small-scale melting furnace, the energy-saving electric melting furnace equipment, melting furnace, easy operation, environmental pollution, is the ideal steel melting furnace, equipment, small size, light weight, smelting capacity from a few kilograms to several One hundred kilograms, a wide range of options for the production of the factory, University laboratories, research institutes, jewelry, processing, casting the ideal processing equipment. Power imported IGBT power devices, more integrated miniaturization, the effective output power of more than 90%, energy saving, energy saving than the traditional SCR IF 60%! 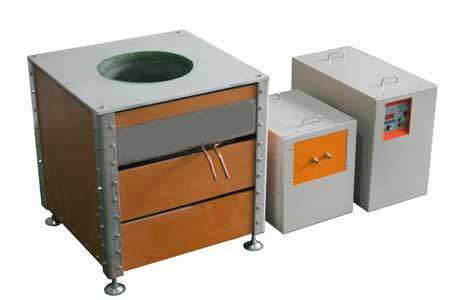 9, according to the recommended equipment and smelting capacity, melting time per furnace is 20-30 minutes.